This is one of the most used makeup apps. It has assisted several women in getting the best makeup that suits them. It can also be used to share images on the internet. The app features lots of makeup effects to changes your image within a short period. This makeup looks professional, which is very vital when it comes to apps like this. There is a broad skincare lesson, which aids users a lot. This app will provide tips to enhance your skin or to get rid of wrinkles, acne, spots, whiteheads e.t.c. Makeups from several brands are listed, so you can try it out to find out how it looks on your face. You are also allowed to edit your teeth, eyes, eyebrows, lips to the exact preference you want. There is 3D to improve your photos and a virtual mirror for a seamless makeup experience. It is free to download. Mary Kay is known for sublime beauty product for females. If you already buy their products, then it must be a source of joy to find out that they have a very useful app too that gives you a complete makeover within a short period. This app is also handy, so you can know the exact Mary Kay product that complements your face. You get to share your results on social media. The images you edit can be saved in your gallery if you fancy that option too. The app is free to download as well plus it has no in-app purchases or ads. It works brilliantly on devices running Android 2.3 and above. This is a free makeup app that improves all images it is used on. If you still need more reasons to get this app, it is from L’Oréal Paris, which is a respected brand for makeup products. The app can replace a selfie camera and become your makeup mirror effortlessly. There is a lot of L’Oréal Paris products on display here. It does not have in-app purchases and ads, so you get no distractions while you enjoy the benefits that come with Makeup Genius. Devices running android 4.2 or more are suitable for this app. This app has some of the best styles to aid your makeup experience. There is a lot on display that you will find it hard to choose. There is even an option for the addition of accessories plus makeup, which will boost the beauty of your images remarkably. Makeovers from some highly-rated makeup artists like Bretman Rock, Nikkie Tutorials, Lisa Eldridge, Christen Dominique, Angel Merino are ready in this app for your use. Makeup Plus supports you to do your research to know the makeup that suits your face the most. It is free to install, has no in-app purchases, but ads are present, so be prepared. This is yet another application from YouCam, and as always, they did not disappoint. All major brands that you know of will be seen here, with some companies even giving sales and other promos to ensure you save some money for other needs. It makes use of AR to add makeup effects on your face, letting it appear more real than expected. There are tutorials you might need to check out to know better about what you are about to get into. 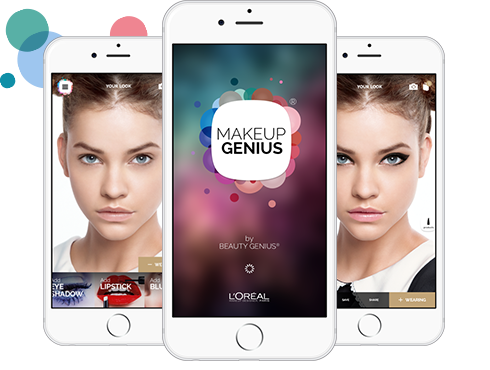 It is an interactive app with other makeup lovers like you present in it for interaction and sharing purposes. Ads are frustrating on this app, but you can go for an in-app purchase to end them. It works very well with Android devices running Android 4.4 and above. The Glam app was developed by makeup artist and famous hairstylist, Joey Maalouf and blogger/actress, Cara Santana. It is one of the best apps for Android. The main feature that comes with the app, making it stand out is the fact that there are loads of freelance artists and stylists that are available to give you professional advice on hair, makeup, and nail related services. With its unique name, the app also stands out. Overspending on beauty products only to bring it home and find out it was not worth the money you pad can be annoying. It is hard to break down the reviews when you are at the store to buy the beauty products. This is where this app can be handy. You can take your phone to the store with an app like Pretty In My Pocket, this allows you to scan any product, and it will notify you about the different reviews about that product. This then aids your means of getting correct reviews of products to enable you to purchase the right thing. This app has loads of thrilling makeup appearances and effect that can assist you to make that photo transformation a memory you will hold onto for life. It comes with a smart face recognition system that can find out about the facial features faster and can assist you to achieve your best result in no time. With lots of makeup effects, you get to customize your overall appearance and can even give yourself a celebrity look easily. You also get to alter the color of your skin, lips, eyebrow e.t.c. Sharing on the internet is also very possible. A vibrant and exciting selfie and portrait image editor. This makeup app presents lots of easy-to-use and robust tools for achieving that beautiful and spotless facial appearance. After you edit, you’ll look like a supermodel covering a top magazine. Sharing is supported. This app is for boys and girls that fancy makeup. It displays to you, the latest beauty trends so you can follow suit plus beauty tips from professionals in the industry so you can take advice from those that know what they are reffering to. There is also a forum where questions can be asked in case you are not clear on the knowledge you seek. With this list of best makeup apps for Android and iPhones, ladies would be able to test and new makeup styles, without having to put them on physically. This app also comes in handy, when you want to edit pictures casually.